DISPATCH FROM THE U.K. | In Year 3, BRITDOC Asks Int'l Audiences, "Why So Serious?" In three years, BRITDOC has transformed from noble experiment (inclusive documentary conference based at a legendary university) to unquestionable success. Set over three days on the Keble College campus in Oxford, UK, the conference (founded and organized by the Channel 4 Documentary Foundation) has become a necessary launch pad for both completed and in-progress nonfiction filmmaking. The 2008 edition will be known for its combination of large audiences (early estimates are at 900 attendees), inspiring discoveries, and unconventionally beautiful English weather. The two big themes for BRITDOC 2008 were comedy and music, and it was hard to miss the threads of both running throughout the events. 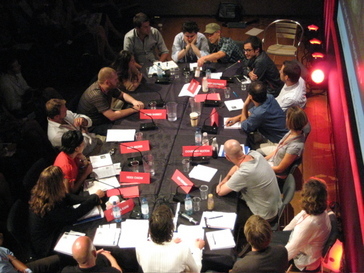 The ability to make comedy from documentary was a popular theme at the festival, particularly at panel sessions with subjects such as “You Cannot Be Serious,” which allowed veterans of the humor doc to discuss their process. However, nothing spoke to this aspect of BRITDOC 2008 more than the “Larry Charles in Conversation” panel held near the end of the festival. At this popular session, the director of upcoming doc comedy Religulous (and doc/fiction hybrid Borat) spoke about his influences in nonfiction film as well as what inspired the making of his new project with comedian Bill Maher. The film, which Lionsgate will release Stateside after screening at the Toronto International Film Festival in September, explores the amusing and incendiary aspects of global religion. “We both grew up in that ‘post-religious generation’ of America,” Charles said of himself and Maher, on the panel Friday. He was referring to an era when second or third generation Americans began to doubt the religious history of their families. Charles shared stories of feeling a connection with Judaism as a child, even considering a future as a rabbi, until his family talked him out of it. As a young kid growing up in Brooklyn, Charles was not the biggest fan of what used to be known as “documentary” filmmaking, until he discovered the work of Frederick Wiseman. “To me, documentaries were like medicine, and as a kid there was nothing I could relate to,” he said, also saying that Wiseman and later Errol Morris as well as Werner Herzog, would offer him a perspective on the power of nonfiction filmmaking. And, recently, “Michael Moore has opened up the door to a whole new world of documentary.” Which makes sense, as footage from “Religulous” screened during the panel, offered a familiar style that recalls the work of Moore or Morgan Spurlock. A group of filmmakers (including actor Gael Garcia Bernal) present their project, “Resist,” to a panel of financiers during The Good Pitch forum at BRITDOC. Photo by Matt Dentler. That’s not to say BRITDOC was without an international flavor, especially with a new strand of programming called “Best of Fests” where curators from worldwide festivals were invited to bring some of their recent success stories. These titles included “Trouble the Water” (presented by David Courier of the Sundance Film Festival), “Obscene” (presented by Fionnuala Jamison of the Toronto International Film Festival), and “At the Death House Door” (presented by Janet Pierson of the SXSW Film Festival). In addition to “Religulous,” other documentaries in production found just as eager an audience as the completed works screening at BRITDOC. Among them, “The Yes Men Fix The World,” a sequel of sorts to Chris Smith, Sarah Price, and Dan Ollman‘s 2004 documentary about the culture-jamming duo that infiltrates corporate summits or news broadcasts to spread their subversive message. At the festival, Mike Bonanno and Andy Bichlbaum (the “Yes Men”) were joined by producer Alan Hayling and editor Kurt Engfehr to screen excerpts from the film, while discussing their brand of issue-oriented doc comedy. That film’s successful BRITDOC history culminated in an Audience Award, bestowed at the festival’s Friday night awards ceremony. Other winners included “Man On Wire” for Best British Documentary Feature and Eva Weber‘s “The Solitary Life of Cranes” as Best British Documentary Short. “Best Pitch” went to Julie Moggan‘s romance novel project, “Guilty Pleasure.” One can only assume her film, after completion, will find its way to an upcoming edition of BRITDOC.